Taking an excursion on the Monte Cristo private catamaran is an great opportunity to discover the Southern coast of Tenerife in a very unique, smooth and intimate way. The boat complies with all the security regulations and offers outstanding commodities. On top of that, Monte Cristo also boasts an incomparable flybridge, which is wide enough to have a rest and admire the breathtaking landscapes from the impressive cabin. It is a true pleasure for the senses to travel on this fabulous ship; being aboard such a perfect boat gives you a powerful feeling of quietness and comfort. Monte Cristo also gives you the opportunity to admire, as they deserve to, the magnificent whales and dolphins that lives around the island all year round, such as the pilot whales and bottlenose dolphins. 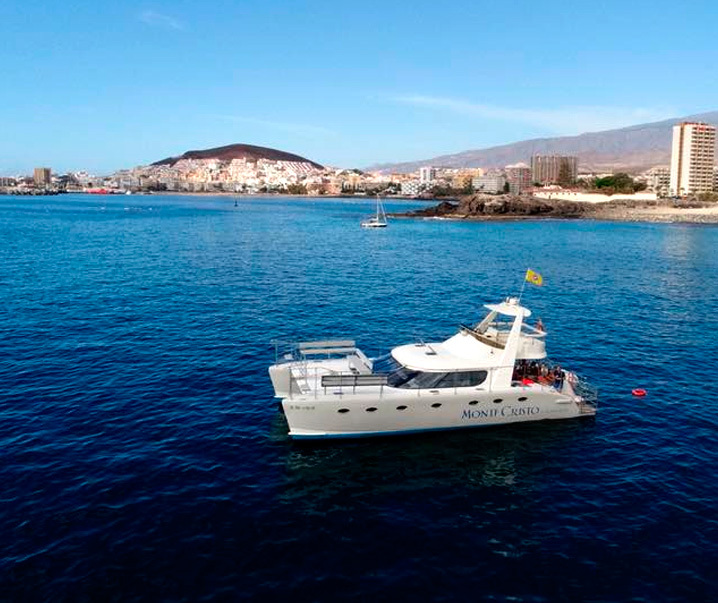 Travelling aboard the well-known Monte Cristo catamaran is a smooth way to discover the blue seas bordering the Canary Islands; its navigation system actually prevents the waves to disturb the whole journey, as the own boat takes care of calming them down. It is worth mentioning that the trip includes an exquisite buffet with exclusive snacks and drinks, to make the whole journey even more enjoyable. 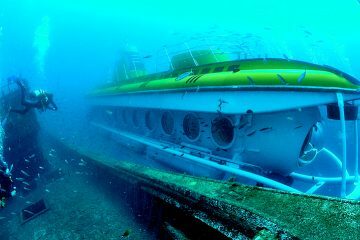 Moreover, at some point during the tour, the boat will drop anchor around the famous Diego Hernández cove, with its crystalline waters, to allow you to swim and dive among the fishes of the island. In short, this is a highly-recommendable activity that gives you the possibility to spend a very entertaining morning while discovering the Southern part of the island, admiring the cetaceans, having a rest on the boat and enjoying a sea bath in the magnificent coast of Southern Tenerife. Exclusive Sunset Private Charter of 3 hours. To enjoy this unique experience, please contact us here. Snacks, Spanish tapas and fruits. Cava, beer and a variety of soft drinks and Juice. Free Transfer Service (Costa Adeje, Las Americas & Los Cristianos). The child rate is valid for 1 to 11 years. Free for babies under 12 months. Maximum number of participants: 12 persons. The trip from getting picked up at the hotel to being dropped off again was top class! The car driver was amazing. Very polite. George and the captain was had we’re outstanding. Lunch was superb. Lots of cava all round. We managed to see both dolphins and whales. Highly recommended!!!!!!!! 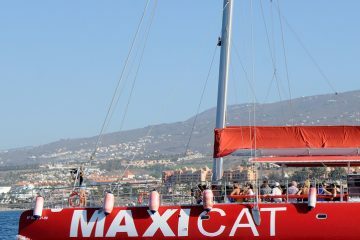 Amazing excursion in an very exclusive boat and with an unbeatable service. Highly recommended !